The next CicLAvia is upon us! It takes place next Sunday – April, 15th between 10a-3p around Downtown LA. Our neighborhood’s closest ride-in access is along Vermont, between Oakwood and 3rd Street (map). 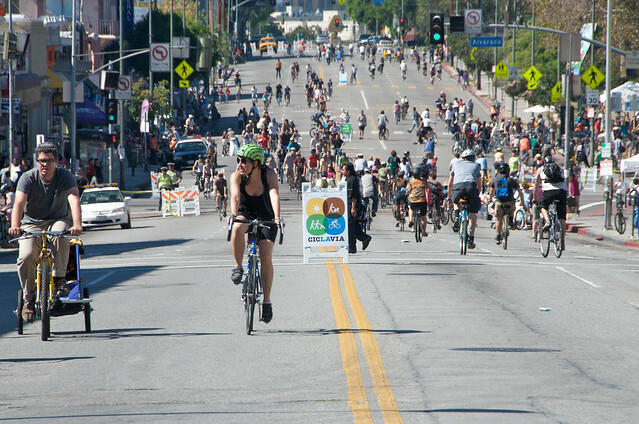 CicLAvia has become a day to celebrate our city and the increasing role that bikes are playing in the future of everyday transportation here in LA. It’s a day when 10-miles of city streets are closed to car traffic so that Angelenos can explore and enjoy parts of the city in a more intimate way. And it’s a day for families, friends and neighbors to connect – with the city and with each other – in a safe and healthy way. This 4th CicLAvia shows signs of an event coming into it’s own. Many LA bike shops have stocked up on bikes that they are making available to rent for the day. Also, an LA-based bike-share company called Bike Nation will make 100 bikes available for free to the first people who sign up online (register here). Bike Nation currently runs bike-sharing systems in Denver and Anaheim. There has been no announcement of a permanent bike sharing plan for Los Angeles…but planning is in the works (see link below). CicLAvia is not only about bikes…people can walk, skateboard, Rollerblade. Whatever it is that motivates you – find a way to enjoy this event! Side note…this is a fun bike shop that we’ve discovered called Flying Pigeon LA. They are named after the Flying Pigeon bike, the black bike that seems to be standard issue in China (they sell those, plus some other really cool bikes). Mostly, we just like the way Josef, one of two brothers who own the shop, shares his inventory with us and makes us aware of how they approach CicLAvia. Flying Pigeon LA will have 50 cruisers available to rent for CicLAvia. Head to the Flying Pigeon site and reserve a beach cruiser for next Sunday! The Flying Pigeon LA store is at 3714 North Figueroa in Highland Park (between downtown and Pasadena)…a short 20 minute drive from the center of Larchmont Village. Mary has lived in the Hancock Park area for over 20 years - including homes in Larchmont Village and Windsor Square. Mary has lived in some great places in her life - but none compare to the convenience and majesty of our neighborhood. For Mary, the neighborhood has been a wonderful home to her large, extended family...at one time she had family members living on seven different Hancock Park area blocks! Larchmont Buzz is a labor of love - built to celebrate the neighborhood and to elevate the conversation in the area.